We currently live in a digital era, where a strong online presence is becoming more and more important in gaining awareness from potential salon clients and maintaining strong relationships with your existing clientele. 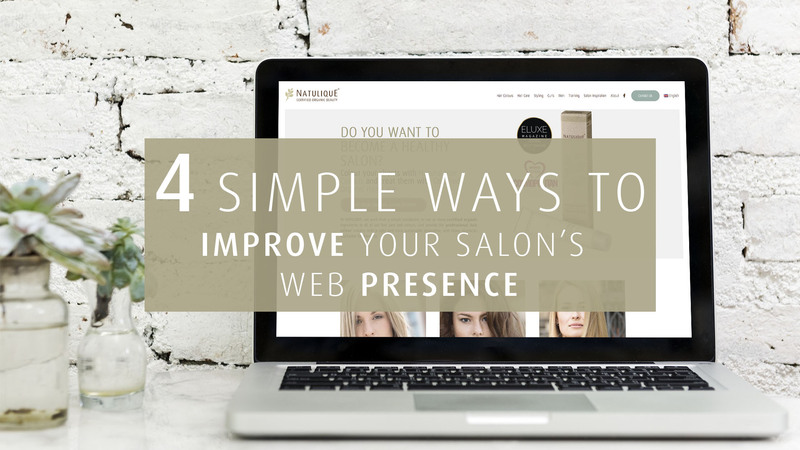 We have gathered 4 simple steps you can take to improve your salon’s web presence, and best of all – you can do it yourself – without being a digital expert at all. Ever considered writing a salon blog? – Go for it! You don’t have to possess journalistic or graphical skills to write blog posts as long as you have something on your mind that you want to share – so don’t be afraid to throw yourself into the world of digital blogging! Ultimately, including a blog on your salon website will help you connect with your clients and fellow hairdressers while at the same time attract new clients to your clientele. Sounds great right? A good example of this is our friends at Claire Hair Boutique who have received a lot of positive feedback on their blog posts. You can read them here. With blogging, you will have a voice and it is a great way of showing off your expertise and viewpoints and to help spread the word about responsible hairdressing. Additionally, blog posts are a great way of creating SEO-optimised content – Wondering what this is? Don’t worry, we will explain! Basically, when using SEO on your webpage you are trying to attract the attention of search engines (Google, Bing etc.). This makes it easier for potential clients to find your salon on the web and may lead them to pick your salon over your competitor’s. SEO includes picking the right keywords, placing them correctly on the page and using a sufficient number of words on your blog. Below, we’ll give you a few key objectives to consider when working with SEO on your salon blog. – A keyword is the word that best describes what the blog post is about. – We recommend that the minimum length of the blog post is 300 words with the keyword mentioned 3-6 times. – Main Headline: You’ll have a main headline (the title of the blog post) which should include your chosen keyword. This will help the search engines with finding your blog post. – Subheadings: It’s important to include subheadings to make the blog post easy to comprehend and to prevent the readers from getting overwhelmed by the amount of text. If it’s possible you should include the keyword in the subheadings as well. – While writing the blog post, you might want to refer to another page on your website. This is called internal linking and can guide your readers towards exploring more of your website. The specific link must always be relevant. This means that the link should “explain” what page the reader will end up on if she/he presses the link. Example: (…) you’re always welcome to book an appointment ← Clicking this link should lead to a webpage which allows the reader to book an appointment etc. This is the most important rule of 2018. – Test it in a real device: Mobile first means that you design your website for browsing it on a phone and once it looks good, you check that it works on your desktop computer. This will enable your clients to easily book from their phone on-the-go and take away the stress of navigating around a cluttered non-mobile optimized website. – Avoid large and complex graphics: When proof-checking your website on your mobile device, make sure that any graphics you have used look good and that they are easy for the visitor to comprehend. The same applies to texts that you have included on your website – Comprehensibility is key. Trust us, your clients and visitors will love you for it – and you will have more happy people in your chair. Social media platforms like Facebook and Instagram are your chance to shine! These platforms offer you the possibility to showcase your salon’s talented work and to engage with both existing and potential clients – This is why you should always make it a priority to reply to comments etc. Facebook is also a great way to create traffic to your website, as you can post links to your salon blog posts. We hope that this blog post will help guide you through the not so scary world of the web – have fun! You would like to learn more about how to promote your salon online? Let us know in the comments!